Water irises requires wet or permanent waterlogged soil. 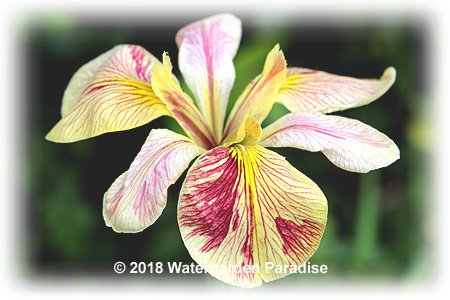 Species and hybrids includes those coming from Iris brevicaulis, Iris ensata, Iris fulva, Iris laevigata, Iris nelsonii, Iris pseudacorus, Iris setosa, Iris tridentata, Iris versicolor and Iris virginica Can be grown in part-shade and full sun location. Should given some fertiliser tablets during their growing months late in winter to encourage flowering in spring and summer. Sold in the form of barerooted rhizomes. These water irises come in a mix of species and colours (blue, purple, white, pink, red, yellow & copper). They are at a special price for the budget conscious buyer. Colour unknown. These were originally named cultivars, but unfortunately the labels have been lost, so we are selling them at a greatly reduced price. Excellent for budget landscaping or large dam plantings if the buyer is not concerned with flower colours. Photo displayed as a guide only. Not for WA and Tasmania. Sold in the form of rhizomes of variable sizes. While stocks last.